Where to go What to Do - Carroll Broadcasting Inc.
Thursday's at 4:15 p.m. and 5:15 p.m. - Friday's at 5:15 p.m.
and 6:15 p.m. and Sat. at 11:15 a.m. So come on out to one or all of these interesting lectures and help support the Iosco Arenac District Library. Ed Beckley: Cell: 989-324-7111, SHOP: 989-646-2444 Email: Edward.beckleyIII@gmail.com Contestants can sign up online at: www.m65baitshop.com Or by Mail to: M65 Bait Shop II, 302s Main St. Au Gres, MI 48703. Make all Checks payable to: Au Gres Area Chamber of Commerce In amount of $35.00. Tawas Community Concert Band - The Tawas Community Concert Band will present "A Musical Potpourri", free concert, Monday, April 22nd at 7:30pm in the Tawas Area High School Legacy Gym. Studen music scholarships presented during intermission. Refreshments provided following the concert. Blue Marlins - Oscoda Blue Marlins Artistic Swim Team presents Red, White, and Blue Marlins, Friday, April 26th at 7pm and Sunday, April 28th at 1pm. Admission is $5 at the door, Kids 5 and under free. Chuck a duck & concessions available. Twisted Twinz Emporium - Come and join in the fun at Twisted Twinz Emporium, Saturday, April 27th from 12pm to 2:30pm for string art/ 2:30 to 5pm Flag Painting. Cost is $35 (50% foes to the Heroes Thanking Heroes program). Location is 1131 W. Lake St., Tawas City. Reserve your seat by calling (989)984-5200. Iosco Conservation District - Reforestation Tree Sale Fundraiser will be held Friday, April 26th, Saturday, April 27th, and Sunday, April 28th. Times are Friday, and Saturday from 9am to 5pm, and Sunday from 11am to 3pm. Seedlings, Transplants, Shrubs, Small Fruit Plants and Fruit Trees are available. Order placed by Friday, Feb. 15th will get a 5% discount, with orders due by Monday, April 1st. A limited supply of excess trees will be available on site on the days of the sale. Pick up orders at Tawas Inn, 1124 S. US23, Tawas City. For full brochure please log onto their website at www.ioscoconservation.org/tree-sale. Tawas Village Art Prize - Tawas Village presents it's 8th Annual Art Prize, Saturday, Apri 27th from 10am to 7pm, and Sunday, April 28th from 2pm to 7pm. $800 total prize money with no entry fee. There will be 3 categories, all media, painting, photography and 3D. People's Choice, visitors will decide the winners! So come and check out the great local artists at Tawas Village, 910 N. Tawas Lake Rd., East Tawas. Loyalty Day Parade - This is an annual event that is put on by the VFW Post in Standish, and will be held Saturday, April 27th from 12pm to 1pm. Parade starts on AirPark Drive located 1/2mile west of the traffic light on US 23 and M61. The parade route is straight down M-61 East to the Standish Elementary School. More than 50 exhibits have been known to be in this parade. Come out and enjoy the festivities! Art Walk & Wine Tasting - Downtown West Branch will be hosting an Art Walk and Wine Tasting in the downtown area, Saturday, April 27th from 5pm to 9pm. So come to West Branch for some great art and sample some wine. Gun Show - American Legion Post #211 in East Tawas will be holding a Gun Show on Saturday, April 27th from 9am to 4pm. Cost is $5 per person. For more info on being a vendor please call (989)329-6153 to reserve a table. Craft & Vendor Show - Impact Ministries will be hosting a Craft & Vendor Show, Saturday, April 27th from 10am to 3pm. The show will be held at the Plainfield Resource Center in Hale. First 50 guests will receive a free swag bag who bring in a new item (no food or formula) for the baby boutique at the Harbor Lights Pregnancy & Information Center. Come out and enjoy shopping with top notch vendors, crafters, Quarter auctions, Chinese auctions. Concessions and more!!! A Night With Sneaky Pete - It will be a night with Sneaky Pete and the Forever Family Band, May 3rd at the Knights of Columbus Hall in East Tawas. The Event is a Fundraiser for Holy Family School PTO. Dinner is from 6pm - 7pm and Sneaky Peat takes the stage from 7pm - 10pm. $30.00 per person, $50.00 per couple and that includes dinner. For Tickets Call 362-5651. Enjoy a great meal and some great down home music! Michigan Bushcraft Spring Gathering - We welcome you to join us at the 2nd Annual Michigan Bushcraft Spring Gathering at Lumberman's Monument and Visitors Center May 3rd-5th! In a collaboration between the USFS Mio Office and volunteer outdoorsmen, artisans, and Michigan businesses, the Spring Gathering is a family-friendly weekend of presentations and demonstrations of various outdoor skills and topics. Free to attend AND free to camp in the Huron National Forest primitive sites around Lumberman's Monument (Monument Campground is closed to the public at that time) it's a perfect opportunity to meet other people interested in the outdoors as well as enjoy the beautiful vistas of the Au Sable River. Regional craftsmen and small businesses will also be onsite offering all kinds of outdoors-related kit. Blues and Brews - Come on out for a special weekend of up close and personal interaction with some of the best in the Blues business, May 3rd and 4th at Forwards Conference Center in West Branch. Experience Northern Hospitality like no where else in Michigan, then enjoy an invite only after party with an all star casual jam, incredible food representing flavors of the Mississippi Delta including some Cajun and Creole favorites. Featuring the finest Michigan beer from Bell's Brewery in Kalamazoo, meet the artists, get signed CD's. Single tickets are $25 and dinner package is $50. One night for 2 includes show and Lumberjack after party, stay at the Super 8 for $139 or at Quality Inn for $159. Two nights for 2 includes both shows and Lumberjack after party both nights, stay at Super 8 for $249 or Quality Inn for $289. Ultimate Fan Experience Weekend Package at Quality Inn for $379. For more info please call (989)345-3503. Get Your Glow On - Come Light Up The Night with the Rose City/Lupton Glow Fun Walk that will be held Saturday, May 4th at the Rose City Park. Registration begins at 8pm in the pavilion. Music, Fun, Prizes, cost is $25 for adults, 5 to 12 years $10, 4 and under free. Cost includes tee shirt and walking tacos. Pre register to ensure shirt sizes by calling or email, Cindy Rosebrough at (989)685-2103 or rosecityhall279@gmail.com. 26th Annual Gourmet Delights - Quota International of Iosco County will be holding their 26th Annual Gourmet Delights, Sunday, May 5th from 11am to 2pm at the East Tawas Community Center on Newman St. Adults $12 and Children (6 to 13) $5, Children 5 and under are free. Tickets are available at Alley Cuts, Tawas Area Chamber of Commerce, and any Quota Member. Drive-In-Diner - Tawas United Methodist Church will be holding a "Drive-In-Diner", Friday, May 10th, from 4:30pm to 7pm. Menu to include Hot Dogs, Chili Dogs, Chips, Pop, Vanilla or Chocolate Shakes. All proceeds to benefit local school activities. Tawas Point Birding Festival - "The Biggest Little Birding Festical in the Midwest" May 16th thru May 18th, 2019. Come to Michigan’s Sunrise Coast to enjoy spring birding at its best, attend birding walks and tours, brush up on your bird identification skills, and support conservation efforts in the state of Michigan! The Tawas Point Birding Festival is a Michigan Audubon Signature Event that is supported by the local chapter, AuSable Valley Audubon. Festival participants enjoy some of the best birding in the Great Lakes region; Tawas Point is well known for high concentrations of migrating warblers during the month of May. Species highlights have included Kirtland’s Warbler, Cape May Warbler, Golden-winged Warbler, Ruby-crowned Kinglet, White-crowned Sparrow, numerous raptors, shorebirds, and more. Over 160 species were recorded during the festival weekend in 2016. The 2019 festival will include guided tours of local hotspots, a birding 101 workshop, bird identification workshops, and opportunities for birders to network and socialize. Festival headquarters will be at the Tawas Bay Beach Resort, 300 E Bay St, East Tawas. Tours will either begin here or at Tawas Point State Park, 686 Tawas Beach Rd, East Tawas. Native Plant Sale - A fundraiser for the Friends of Tawas Point Lighthouse and State Park will be held Saturday, May 18th from 10am to 4pm at the Tawas Point State Park. There will be lots of Michigan Native Plants for sale and there will be Master Gardeners on hand to answer any questions. Pots prices $3 and $5. Heritage Coast Sail Days - Step into another world when you step on board, Monday, May 20th thru Sunday, June 2nd. You'll hear the waves on the hull as you slice through beautiful Tawas Bay powered only by the wind as you relax and enjoy the gorgeous views. Heritage Coast Sail Days offers many types of sails throughout the day and evening to provide you with the sailing experience you've only ever dreamed about. Choose from cruises that allow you to learn, participate, paint, team build or just put your feet up and relax. All sales are final. This is a non-refundable ticket. All sails are rain or shine. In the event of dangerous weather that prevents the ship from departing, we will issue a rain check good for a future sail of equal value. All Tawas Bay sails depart from the East Tawas State Dock at 113 E Newman Street, East Tawas, MI 48730. Michigan High School Rodeo- Whittemore will be hosting the Junior High Year End State Finals of the Michigan High School Rodeo at the Whittemore Community Arena Saturday, May 25th at 1pm and Sunday, May 26th at 1pm. The Michigan High School Rodeo Association is a youth based organization where students in grades 6th thru 8th and 9th thru 12th compete in rodeo competitions. Members compete all over the state of Michigan thru out the year for year end awards. At the completion of the state finals, the top four in each event qualify for the National High School Rodeo Association national finals in their respective divisions. Members also compete for scholarship dollars to help continue their education after high school. Check out www.mihsra.com to find out more. For more information please contact Cindy Cowles (989)390-1741 or Teri Valent (989)254-1656 and Connie McAdams (989)305-8399. Shoreline Arts & Crafts Show - The 27th Annual Shoreline Arts & Crafts Show will be held at the Tawas Shoreline Park, Saturday, May 25th from 10am to 5pm, and Sunday, May 26th from 10am to 4pm. Some come and check out all of the vendors, and enjoy the bay. 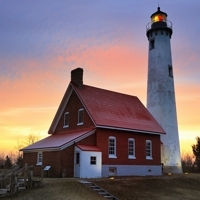 40 Mile Lighthouse - You are invited to join us for our annual “Afternoon of Arts & Crafts” show which is held in Presque Isle County's Lighthouse Park, Saturday, May 25th and Sunday, May 26th. You will have the opportunity to enjoy the work of many talented Artists, Musicians and Crafts people from all over Michigan. Memorial Day Week-end is also the Annual Open House Week-end at 40 Mile Point Lighthouse. This is a great family setting offering visitors a chance to step back in time surrounded by history or just sit a spell and enjoy the view! 2019 Au Gres Annual Memorial Day Parade, Come Celebrate & Honor Our Heroes! Sunday, May 26th, 2019 starting at 1pm, Parade begins at US-23 & Water Street in Au Gres. Kids who decorate and ride their bikes in the parade will receive a free cone coupon donated by Zanners IceCream Shop! Call 989-876-6688 to enter & for information. Michigan Free Fishing Weekend - Two days twice a year, families and friends can enjoy one of Michigan's premiere outdoor activities, Michigan Fishing, for FREE! The 2019 Free Fishing Weekend is scheduled for June 8 & 9. All fishing license fees will be waived for two days. A Recreation Passport will NOT be required for entry into state parks and recreation areas during Free Fishing Weekend. Residents and out-of-state visitors may enjoy fishing on both inland and Great Lakes' waters for all species of fish. All fishing regulations will still apply. During the Summer Free Fishing Weekend it is also Free ORV Weekend! Many locations around the state hold fun events during the weekend. Sunrise Solstice Festival 2019 - Promoting art and music in the Tawas area on beautiful Tawas Bay, Saturday, June 15th from 8am to 10pm to raise funds to enrich the lives of students at Tawas Area High School. Activities will include a plein air art competition, live music, artist marketplace, art mini sessions, a cuisine corner as well as many family activities. For more information, please visit their website at www.sunrisesolstice.org. Motown Eagles - Rogers City Theater will be hosting the Motown Eagles, Saturday, Junt 15th from 7:30pm to 9:30pm. Performing the musical hits of the Eagles spanning nearly four decades. Music hits include "Hotel California", "The Best of My Love" and "Take It To The Limit." Combining their musical talents, these five talented musicians from Detroit blend their voices and instruments to perform the classic hits of the Eagles. Their band is featured in Michigan’s adjudicated Arts & Humanities Touring Directory.Performance at the historic Rogers City Theater located at 257 N. Third Street in downtown Rogers City.